Secretary of State Rex Tillerson walks to his chair during the U.S.-Mexico bilateral meeting on disrupting transnational criminal organizations at State Department in Washington, Dec. 14, 2017. U.S. Secretary of State Rex Tillerson will join members of the United Nations Security Council on Friday to discuss putting "maximum pressure" on North Korea to abandon its nuclear weapons program just days after he appeared to extend an olive branch to Pyongyang. The State Department said Tillerson would call on all UNSC members to work together to continue the economic and diplomatic pressure campaign against North Korea in order to compel its regime to end its nuclear and ballistic missile programs. U.N. Secretary-General Antonio Guterres, left, and Japanese Prime Minister Shinzo Abe pose for a photo before their meeting at Abe's official residence in Tokyo, Dec. 14, 2017. Tillerson will also meet with U.N. Secretary-General António Guterres on Friday. 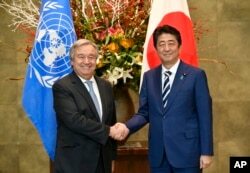 North Korea was high on the agenda in the meeting between Guterres, who was visiting Tokyo on Thursday, and Japanese Prime Minister Shinzo Abe. "The objective is the denuclearization of the Korean Peninsula, and it is extremely important to preserve the unity of the Security Council. Unity of the Security Council — that is a very important tool to achieve this goal but also to allow for diplomatic engagement that might allow this goal to be achieved in a peaceful manner," said Guterres during a press conference Thursday at Japan National Press Club. Guterres reiterated United Nations Security Council resolutions on sanctions against North Korea's nuclear and missile programs needed to be fully implemented by all countries. 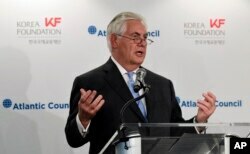 Secretary of State Rex Tillerson speaks at the 2017 Atlantic Council-Korea Foundation Forum in Washington, Dec. 12, 2017. ​Earlier this week, Tillerson said the international pressure campaign has achieved results that were not seen by previous efforts. "When fully executed, this is going to deny North Korea about $2.3 billion of their export revenue — complete ban on coal, textiles, export of forced labor; import limitations on fuel and oil," said Tillerson in a State Department Townhall meeting on Tuesday. On Tuesday, the chief U.S. diplomat also said Washington is ready to talk with Pyongyang without preconditions, only to have the White House put out a statement hours later, saying, "The president's views on North Korea have not changed. North Korea is acting in an unsafe way, not only toward Japan, China and South Korea, but the entire world." Tillerson had a lunch meeting Thursday with President Donald Trump.